Participants would then be asked whether or not Heinz should have stolen the drug, followed by a series of additional probing questions. Kohlberg was less interested in whether the answer was “yes” or “no” than he was in the reasoning the subject followed to arrive at an answer. 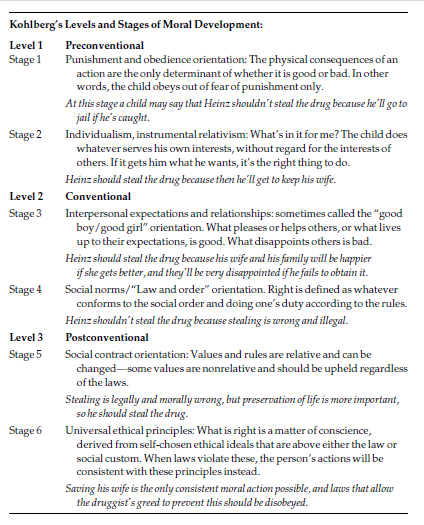 Based on the responses his subjects gave to the dilemmas, Kohlberg concluded that people progress through three broad levels of moral reasoning, each of which he further subdivided into two speciﬁc stages (see table on following page). A convention is a standard rule or practice agreed to by a society. Kohlberg’s levels are distinguished from each other in terms of the role of conventionality in moral reasoning. The preconventional child has not yet internalized conventions as the source of right and wrong, whereas the conventional child (or adult) bases decisions on what is or isn’t expected, either by legal authorities (Stage 4) or by friends and family (Stage 3). In the postconventional level, the person has moved beyond social conventions as a source of morality, basing decisions on personal conscience rather than the expectations of others. In Kohlberg’s theory, these stages are universal and invariant, meaning that all children should move through the same stages in the same order. The timing of the stages is not invariant, however: people move through them at a different pace, and the ﬁnal stage achieved will differ from person to person as well. A major criticism of Kohlberg’s theory has been that his data, based on male subjects, produced a theory that focuses on and rewards a traditionally male perspective on morality. There may be some truth to this, as his original research was conducted using a sample of upper-class males, and so Carol Gilligan is correct in pointing out that female perspectives were missing from his theory. In 1982 Gilligan proposed that Kohlberg’s higher stages at the conventional and post conventional levels reward a justice ethic, which she saw as primarily masculine, whereas a care ethic emphasizing concern for others and the maintenance of relationships, which Gilligan considered the source of women’s moral reasoning, was regarded in Kohlberg’s theory as less moral. Gilligan went so far as to propose a separate sequence of stages for women, based on a test that considered actual behavior in real-world moral dilemmas rather than hypothetical Kohlberg-style dilemmas that didn’t resemble anything the participants had actually been through. The problem with Gilligan’s approach is that it may be unnecessary. Largescale tests of Kohlberg’s stage theory mostly fail to ﬁnd any consistent gender differences, because both men and women can and do follow both the care orientation and the justice orientation, and neither approach is consistently scored at a lower level. A bigger problem with the universal applicability of Kohlberg’s stages involves cultural differences rather than gender differences. Cross-cultural studies have found that people in more rural, less technological cultures progress through the stages more slowly, and achieve a lower end-stage, than the American samples on which the theory was based. Kohlberg rewards reasoning based on justice and autonomy, but in some societies community and duty are considered more important. Within the United States, however, data have provided remarkably consistent support for Kohlberg’s sequence of stages and their universality, though the usual rate of progress through the stages is slower than Kohlberg envisioned. 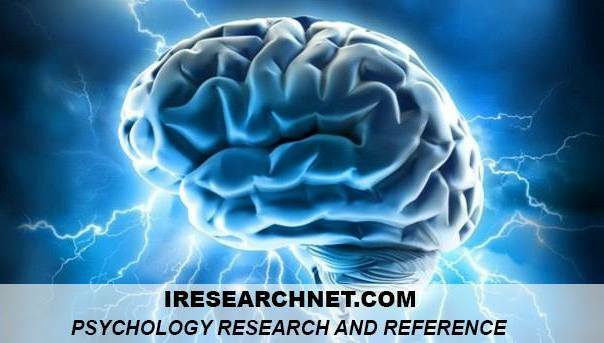 In a twenty-year follow-up of Kohlberg’s original research participants, Stage 1 reasoning wasn’t found in anyone after age sixteen, but some subjects remained at Stage 2 well into adulthood. Stage 3 and Stage 4 reasoning were frequently used in adulthood, but only 10 percent of subjects in their early thirties used Stage 5 reasoning, and not a single one of Kohlberg’s original participants ever reached Stage 6. While this last fact has been the basis of some criticism of Kohlberg, it can also be seen as evidence that his theory provides a reasonably accurate description of human morality. A cursory glance at human history, and at the present state of the world, will sufﬁce to demonstrate that the highest levels of moral development probably should be regarded as fairly rare. Kohlberg, L., and Elfenbein, D. “The Development of Moral Judgments Concerning Capital Punishment.” American Journal of Orthopsychiatry, 45 (1975): 614–639.